Emotions, and the every day lives of Washington D.C. residents, told by these people. Lively characters, and well-written. Kesia Alexandra was born in King of Prussia, Pennsylvania to Paul and Anita Webster. 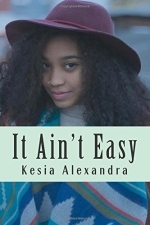 Kesia Alexandra is a 25 year old writer from Washington, DC. She began writing professionally at 17, reviewing books for the Amsterdam News in New York. She is the co-author of “Freshman Year: Bullies Beware!” and the author of “It Ain’t Easy” and “Eating off the Floor”. Kesia has been published in various literary journals. In 2014 she received an award from the Society for Humanistic Anthropology for her short story “It Ain’t Easy, Girls, It Ain’t Easy”. She was invited to speak on the same story at a conference hosted by the North American Review.